Turtles, Snakes Among Dozens of Exotic Animals Found in Abandoned Home in Portsmouth, Va.
Police officers in Portsmouth, Va., called to an abandoned home to recover a stray dog found dozens more animals inside -- and none of them were the usual house pets. 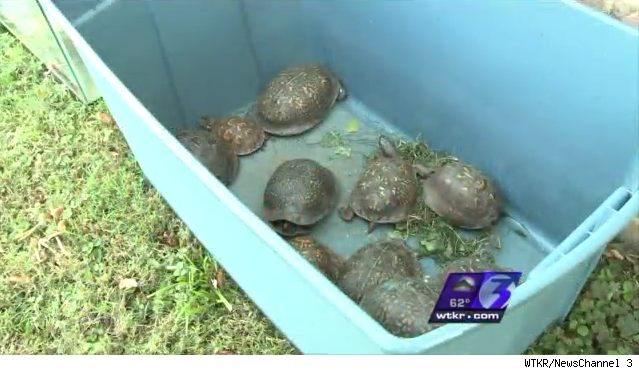 Twenty-three turtles of various sizes, a 4-foot-long canebrake rattlesnake, an eel, a shovelnose catfish and a lovebird were found trolling broken fish tanks, dresser drawers and other parts of the home, local TV station WTKR reported. Two more turtles, each weighing about 50 pounds, were found in discarded bathtubs in the home's backyard. Five turtles and three snakes were found dead, and all the animals were thought to have been abandoned for at least three months. It's a scary housing market out there -- and not just because of home values. In this slideshow from This Old House, home inspectors from across the country sent some of the funniest, most eye-popping sights they've ever had the misfortune of stumbling upon. Click through to share their grief! Whoops! Who moved the house? National Property Inspections of Central CT, Inc. Taking showers in front of an electrical panel box is not recommended. If this isn't a set up for a Jeff Foxworthy joke, I don't know what is. Click the next image to see just how much faith this homeowner has in his plumbing skills. Shows how much faith this homeowner had in his plumbing skills. Rather than test the leaky faucet, he opted to wash the dishes in the bathtub. This basement toilet seat is 48 inches above the floor. Hand rails are recommended. If you tilt your head, it looks just fine. Unless, of course, you're into the Tim Burton look. Ever heard of water hammer? It's that banging sound caused by air in the pipes. Well, this family used an actual hammer to cancel out the noise. Do you think this is what the civic inspector had in mind when insisting that the electrical panel be labeled? "Sure, we can put a window there! All we need to do is remove the post from under that big beam and then nail a 2x6 to the wall so the beam doesn't fall down—and take the house with it." What man cave would be complete without a makeshift urinal? You should see his other funnel -- it looks like a toilet. So, is the cottage cheese container holding up the shelf or is the shelf holding the cottage cheese container tight so sewer gas does not escape? Or is it both? The seller kindly left the dog in the back yard during the inspection, with me all alone. I was supposed to talk sweetly to it. It did not work, and I did not enter. Try as I might, I haven't been able to find a reference to frogs in the National Electrical Code. I think it is safe to assume that this furnace is not venting properly. I inserted a smoke emitter into the burn chamber and all of the smoke backed up into the attic. A rain cap that was installed on the chimney exhaust left little room for venting. Ranger Rick was none too happy when we asked him to pay his share of the mortgage. The furnace thermostat wire had shorted out on a new, still-vacant house, and this was the inside temperature reading I got. Laminate counter tops were de-laminating. What was the builder thinking ending the downspout right above the electrical panel? After 15 years, guess what the inside of this panel looked like. This is a car battery jumper cable attached to the main electric utility service line. The cord leads back to the electric panel for a house with no power. Why pay for electric when you can do this? Why screens on dryer vent backdraft dampers are frowned upon. I found this in a 3½-year-old house. This liquid propane tank is being used inside the house to operate a gas stove—a big no-no. That sheet metal should hold up the rafters at least until we get it sold! This house had an attic fire and was supposedly repaired. The whole roof will have to be rebuilt again. Looks like this little guy wasn't licensed to work around electricity. Next time, call in the professionals. During our unusually cold temps in January, this unfortunate squirrel thought that he'd be OK if he just went down the chimney and followed the source of the heat. He ended up inside the furnace cabinet and got caught between two sections. I don't believe this tackle box meets the electrical code in any state or province. One of the many reasons why Santa needs life insurance. Not the greatest use for an old bicycle inner tube, but at least they're recycling: This is a steam pipe in a 4-unit apartment building. Quite a two-fer! This doorstop also makes water. Rust, corrosion, and a gaping hole in a vent pipe that angles downward (hot air rises, you know). Sometimes, you just have to wonder. They don't build 'em like they used to. This 100-gallon electric water heater was built in March of 1938 and is still delivering hot water like it was built yesterday! Authorities called in local reptile rescue group VIIPER -- Virginians Interested in Protecting Every Reptile -- to recover the exotic animals and take them to animal shelters. "I've never seen a case of abandonment like this -- ever," Eric Crabtree of VIIPER told WTKR. Talking to local ABC affiliate WVEC, Crabtree added: "The whole house reeked of decay. It was filthy. It was just horrible living conditions because nothing had been cleaned or fed." Edith Sessoms, a neighbor of the abandoned home, told WVEC that a man, a woman and a boy had been tenants there. According to data from listings site Trulia, the home was sold on Aug. 28 for $35,000. "We had been smelling a bad odor [coming from the house], but we thought maybe they go fishing a lot," Sessoms said. "They really needed masks on in there, to tell you the truth, because the smell was so bad," she continued, referring to the workers who recovered the animals. "One of the workers that was bringing his stuff out did throw up." Police are still looking for the owners of the animals, and the Portsmouth Humane Society is now looking for homes for the turtles that were rescued. It seems that cases of exotic animals living in homes aren't too few and far between. Earlier this month, police discovered 13 exotic animals -- including a tarantula, two alligators and five pythons -- living inside a Brooklyn apartment in New York City. But even stranger things have been found inside homes, such as the cremated remains of 56 people and $7 million in gold.